Eat foods that contribute to good eye health. Vitamins C and E, zinc, lutein, zeaxanthin, and omega-3 fatty acids are essential for healthy eyes. These nutrients can help prevent cataracts, clouding of your eye lens, and even age-related macular degeneration. Overall a good healthy, balanced diet is going to be helpful for your eyes. Eat carrots. 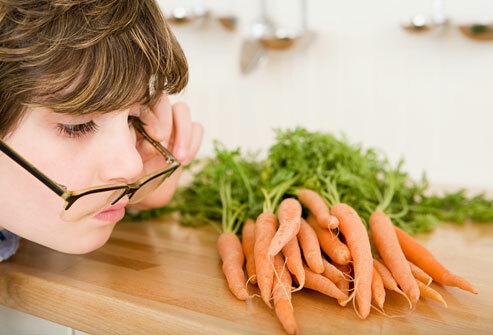 If you eat carrots, this leads to better eyesight. Eat foods that contain omega-3 fatty acids. Eat a serving of fish that contains omega-3 fats once or twice per week, such as wild salmon or sardines. Or, if you are not a fan of fish, take a daily omega-3 supplement.